Welcome to Fiction Friday! Today Dorinda is our host at Treasures in Jars of Clay. Be sure to join us there for links to more fun fiction! And if you're posting fiction with us, don't forget to add your link to Mr. Linky at the end of Dorinda's post. See ya there! “I'm so tired of it all,” Carla complained as we dug through boxes looking for costumes for the Easter Presentation. “You're already tired of looking? We've only just begun and there are six boxes,” I joked, hoping to side-track her. My hands stopped above the box and angel wings fluttered onto my lap. Those would work for one of the pre-schoolers. Where's Pamela, Lord? She would know how to handle this. The room was so silent the clock sounded loud to me. If I sit here long enough she'll laugh and tell me she's kidding. But she didn't. “Did you hear what I said?” she demanded, back ramrod straight and fists resting on her thighs. Help me out here, Lord, because this is way out of my league. I waited for Divine intervention, but none came. “Why do you think that?” I hesitantly asked. Whoa. For starters? I made my hands dip back into the box and lift out the next thing. What's the king's sash doing in here with angel wings? Focus, Gracie. Control, Gracie. Get control. I gritted my teeth, trying to listen to common sense, but my rash side was getting in the way. Real world? Girl, let me tell you about the real world! I counted to ten, then to twenty, but it didn't work. “The real world? I'll tell ya' about the real world, Carla. In the real world we're required to grow up and get our eyes off ourselves. In the real world we have to buckle down and do a lot of things we don't want to.” Carla's eyes widened, but I was on a roll. “In the real world we have to work our hineys off to make dreams come true because there is no fairy godmother who will wave her magic wand and give us everything we want. In the real world life is not all flowers and romance, it's blood, sweat and tears and running on commitment when the love's run out, and then coaxing the love back to life. The real world is not like we imagined back when we were playing dolls.” I lowered my hands into my lap and looked at my stunned friend. Oh, now that was real inspired, Gracie. See, Lord, I told ya' that I wasn't the one for this job. Now what? Carla slowly closed her mouth, her back losing its stiffness. Once again I heard the blasted clock and, without thinking twice, reached over and pulled its plug, putting an end to its incessant ticking. I threw a shepherd's headdress at her. “Back then you wanted to get married, have babies and raise a family. Are you willing to give all that up just to get Darren to listen to you or to see if he cares?” I asked her. “Like myself?” she asked wryly. Dont' forget to join us at Treasures in Jars of Clay. Time flies when you're having fun...and busy, and another month has slid past without doing a blessings post. In the confusion and busyness of December I put off telling you about some of December's blessings, so I'm adding them to this month's blessings. At the very beginning of December I received this print from Joy of Bee Joyful Quilts. She found me as a result of my joyful cow (in my sidebar) and she sent me this print as an encouragement. I just love it! Thank you, Joy!! If you enjoy quilting, (and I do!) you'll enjoy Joy's site. Then, as a result of the The Internet Cafe's Holliday Giveaways, I won two items. One was this darling pin handcrafted by Deena of Dances with Monkeys. It's on my purse and it reminds me to love. Thank you, Deena! December came to a close with another special blessing as a result of the Holiday Giveaway. A very special bracelet from Loni of Writing Canvas. There is a birthstone for each of my five children, and on the sides, between little blue hearts, are small birthstones for the two babies we lost. This bracelet has quickly become a treasure. Thank you, Loni! 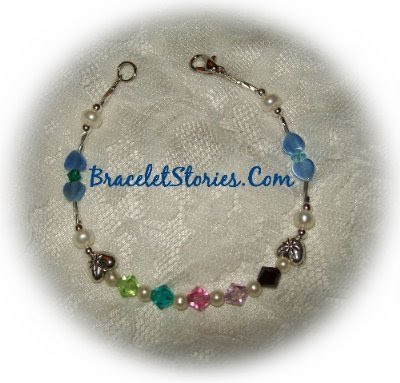 Be sure to stop by Loni's site, Bracelet Stories, for your own memory bracelet. Loni is an incredible woman, and the bracelets she custom makes are stunning and so full of meaning. Well now, that wraps up December's blessings. Thank you, Joy and Deena and Loni! You each blessed me tremendously! Sometime within the next week, I'll post about January's blessings. Stay tuned! The other day I entered the dining room and saw a paring knife sitting beside the four wick candle I've been burning this month. My darling husband had decided that the candle was burning its wicks too fast, leaving a whole lot of wax unused, so he helped it. He trimmed the wax from the top of the candle and dropped it down into the melted wax. He did that many times and even trimmed off the side to feed the wicks and keep them burning longer. His objectives? To enable us to see the flames and to keep the wicks burning long enough to burn up all the wax. Our Heavenly Father has similar goals for our lives. He wants the flame of our life to be visible to those around us and He wants us to burn up for Him, not burn out. Originally, the whole purpose of candles was to illuminate the darkness. We're to be doing that, too, but we can't be effective if our flame is obscured by walls of unused wax. That's when the paring knife needs to come out to trim down the wax. Sure it changes the candle's appearance, many times leaving it much less appealing, but if the end goal is to illuminate the darkness, that's what needs to happen. Too many times we're so concerned with having a visually appealing candle that we don't worry about how long the wicks last. If they get a little too long and start to smoke, we just trim the wick, without thinking about the burn time we're losing. God goes about it differently. He trims the wax and drops the shavings into the melted wax pool to raise the wax level, not worrying about the outward appearance. He wants the wick to burn all the wax. Have you ever noticed that the unburned wax of the candle ends up being an empty shell that hides the flame? What's the whole point of the candle? The wax or the flame? If it's the wax, then we're right to worry about the shell that's left unburned. If it's the flame, then we need to allow the work of the paring knife and feed the wax to the wick, making sure the wax burns so it doesn't obstruct the light of the flame. Well, now that I'm recovering from the shock of deleting my sidebar (LoL), let me tell you about At The Well. There's a Grand Reopening going on, complete with door prizes that you really don't want to miss out on! I'm really excited about their new layout and I think you'll like it, too. I'm honored to be part of the team there, and I'll be posting about Reflections on the Home. Other topics are: To Raise Them Up, Gathering At the Well (where older women are to encourage the younger women), To Have and To Hold (you guessed it: marriage), and Reflections on His Truth. Be sure to join us over there and get in on the fun! Sooooo, guess what I'll be doing in my spare time this week end? Yup! You got it! Welcome to Fiction Friday! I'm so glad you could join us! We've had a quick change of plans, and Mr. Linky is here today. We hope you enjoy!! Kim wished the floor would open up and swallow her. She settled into the pew and studiously opened the bulletin, hoping no one would notice her. Jeff had been called to work as they were walking out the door to church, leaving her to face this first Sunday back on her own. The hand on her shoulder made her jump. Taking a deep breath she pasted on a smile and looked up, dreading the pity and platitudes most people offered. What she found was Kyle's smile. Becky, Kyle's wife, squeezed past him and reached out with a hug for Kim. “I'm so glad you still came.” She sat down beside Kim just as Deb joined them. “Kim! I wondered if you'd make it today.” After another hug Kim took a shaky breath and a swipe at her eyes. Becky and Deb caught each other's eye. “Virginia's knee is doing better, so she's teaching Sunday school this morning. It'll be so good to have her back—I've really missed her,” Deb said. “I'm here! Did I miss something?” Two more couples sat down in the pew in front of Kim, and the ladies reached back to squeeze Kim's hand. She was completely surrounded by her Sunday school class members and their husbands. Lord, I feel like You wrapped me in a web of love. These sisters You've given me are so precious. Thank you. I think I might be able to face the rest of the world now. “Oh, Mrs. Miller, were those your pickles at the fellowship last month? They were simply delicious. Do you share your recipe or is it a family secret?” Becky stood up, blocking Kim's view of Mrs. Miller. Losing a baby is never easy and well-meaning people can say things that cause a lot hurt, even though there is truth in what they're saying. Thank God for the web of love He wraps around us. Sometimes it's through friends or family members, and sometimes it's through a special verse that speaks directly to our heart at that moment in time. However He works, He is there, loving us and holding us tight. Thank God for His love! 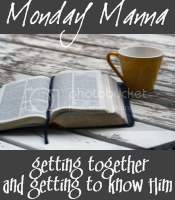 The last couple weeks I've been thinking about service and God's will and now, thanks to Joanne and Monday Manna, God's call...which has brought me to this week's Word Filled Wednesday. So where are you? (and where am I?) 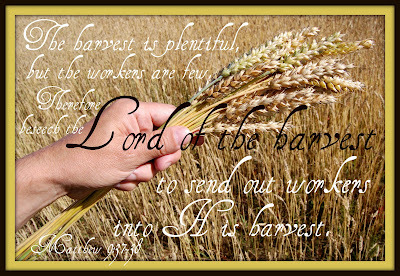 Are we praying for the Lord to send forth workers? Are we listening to His voice and His call? Are we saying 'Here I am! Send me!'? My prayers is that we are involved in three. run to the 160 Acre Woods! 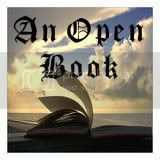 Monday Manna is hosted this week at An Open Book. 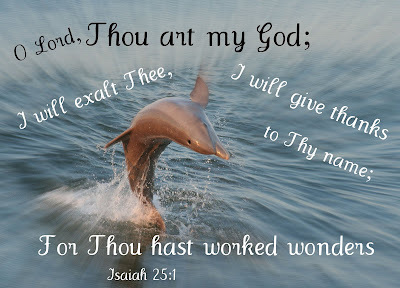 I was so excited to see that Joanne had chosen this verse for Monday Manna this week! This is one of my favorites because it's tied in with missions so often, and as you know, missions is near and dear to my heart. But as I thought about this verse, my mind went back to something directly related to church—our local church. You see, although I have five kids, I'm not a kid-loving person. I don't go out of my way to be with children. That being said, I had been praying and asking God to use me in some way in our local church. So, when my phone rang and I was asked to help teach the grade school girls on Wednesday nights, I said yes, with no dithering about it. And I started praying! I'm not only not a kid-loving person, but I'm not a teacher. I'm very capable of working with the kids, and teaching them, but it's not one of those things that turns my crank and that I get excited about. But you know what? That doesn't matter. What does matter is a willing spirit. When I received that call, I felt God was asking, 'Who shall I send? Who will go for us?' And although my knees were knocking and my brain was squawking, I said 'Here I am. Send me!' There is no exception clause to that verse—there's no 'only if it's doing what I want to do'. In fact, in that verse God doesn't say where or what. He just said 'who'. I've come to see that there are times in our lives when we need to step up and fill the gap, even if we're not a perfect fit for the gap that's there. Please understand that I am not endorsing filling our plate with things that shouldn't be there. Things that are good but take up the space that the best is supposed to be taking. I'm not endorsing jumping in and saying yes to everything. What I'm saying is that there are times when there's a real need that needs to be filled, that we're capable of filling. Those are the times that we need to step forward and say yes to, even though we'd rather not. When that happens, we need to keep praying that the Lord of the harvest will send forth the laborer to take over for us. I know that some people have way too much on their plate—those are not the people I'm talking about. I'm talking to people like me. People who do have some room on their plate. We can fill a hole without over-burdening ourselves, or our families. It doesn't have to be a perfect a fit for us if we're filling a hole we're capable of filling. Our willing spirit and love for God will fill the cracks enough until a person who is a perfect fit comes along. I visited Joanne who visited Kristen and here's the result—a fun little, quick to do meme for this Saturday. Feel free to consider yourself tagged and join us! This week, Fiction Friday is at Lynn's blog, Faith, Fiction, Fun and Fanciful. Be sure to join us there for links to more fun fiction! I really don't think Attila the Hun could've done a better job at pillaging my day than my family did. It started this morning with Allyssa. Today I planned on cleaning and organizing the living room and dining room since those were the rooms that disintegrated when life got hectic. There were piles that were toppling, and my patience with them had run out a week ago. My schedule was painstakingly kept clear for today, and I planned on conquering the mess and then celebrating with a bubble bath—all before the kids got home from school. Running some laundry through would be no big deal. “Ok, but next time you'll wear it with the stain if you leave if for the last minute.” I checked to see that she understood I meant what I said. She bobbed her head, repentantly. “Extra credit in Driver's Ed? I suppose it's worth it, let's go.” I grabbed my keys and we trotted out the door as I called for the other kids to finish eating. “Today? Bryce, why didn't you tell me yesterday?” I asked, my patience slipping away just as surely as my coveted bubble bath reward was. Being the home management expert that I am, I grabbed my ever-present to-do list off the fridge and jotted notes as he ticked off each call. “Mechanic, dentist and church. Got it. You want that with a cherry on top?” I meant it sarcastically, but I managed to say it sweetly, complete with a smile. Bryce plucked the list from my hand and scribbled “CUPCAKES 11:45!” He handed me my list and flashed his father's killer smile. “Thanks Mom. You're the greatest!” I rolled my eyes at him as he buzzed my cheek and fled before I could say no. “Look on top of the pile on the coffee table.” I called as I added Allyssa's uniform to my rapidly growing list. “Thanks, Mom.” She spun around and slammed into her dad. I saw it happen in slow motion, and saw all hopes of my bubble bath drain away as coffee coated the carpet. Instead of celebrating with a soak, I'd be slaving with the steam vac. Ok, Lord, I get it. Kids are like oxen. I really wouldn't trade off the blessing they are, so that means I have to deal with the quirks of being a mom, even on days when I feel like I'm being drawn and quartered by Attila the Hun. LoL--This IS fiction, it really isn't a picture of my house in the morning, but it probably could be if we were in different circumstances. The feelings of the mother are genuine--straight from my life on many days. Be sure to join us at Lynn's for more Fiction Friday! One of the things I'm doing this year is getting back into Scripture memorization, even though I'm not walking in the mornings now. I've joined the accountability team at Beth Moore's Living Proof Ministry blog where we meet on the 1st and 15th of each month to check in and write out the verse we'll be memorizing over the next two weeks. It's incredibly amazing and encouraging to see the number of people doing this. Wow! We're to be courageous and act, not just sit there trembling and hiding in our cozy little corner. We have God's promise that He will be with us, enabling us to do the work He has called us to—until the work is finished! This is right where I'm at now. Until the work is finished. I have work I need to finish so I need to be strong and courageous and act. This is a verse that has jumped out and grabbed me several times over the years, and I had been asking God which verse to memorize next. When I looked this passage up for my lesson, I knew this was the verse. I challenged the grade school girls to memorize it with me and told them that I hope to be able to quote it to them next Wednesday. I also enticed them with a reward if they could quote it, and a few of them seemed interested in taking up the challenge. When I was putting on my eyeliner the other day, I noticed that although I wasn't in a shadow, I wasn't getting the benefits of full, direct light. So, I tilted my head just a touch and I was able to see so much better. I thought about this as I finished putting on my makeup, and how it parallels my spiritual life. There are times when I'm in The Word and growing, but I'm not tilted just right to catch the full benefit of the Light, so I don't see all the things God has for me to see. A simple fine-tune adjustment is all it takes to be fully in the Light. The other week, Pastor Mike showed me the adjustment I needed to make in my spiritual life. For many months the cry of my heart has been for God to use me, that my life would count for Him. Although I was standing in the Light with that prayer and desire, I wasn't getting the full 'benefit' of the Light. I had wrong priorities. I realized I was seeking God's hand more than I was seeking His face. Yes, I was seeking Him, but my eyes were focused on His hands all too often. The words to the old hymn are a great reminder of this. I needed to make that fine-tune adjustment and shift my main focus from His hands to His face, and remember that He will take care of the rest. Yes, ask for His hand of help, mercy and blessing, but seek His face first and foremost. but on Who we face—God Almighty. Heavenly Father, so many times I've sought Your hand—for help and guidance and blessing, but Lord, it's Your face that I long to see. Help me to remember to make that fine-tune adjustment and to seek Your face, knowing that You will take care of all the rest. I love You, Lord. In Your name I pray, amen. This week, Fiction Friday is at Cat's blog, A Work in Progress. Be sure to join us there for links to more fun fiction! Kelly jumped at the knock on her front door, her seam ripper jabbing into an already sore finger. “Kelly? You in there?” The voice of her sister Laurie came through the screen. “Sheesh! You’re in a lovely mood today. Kids been monsters?” Laurie had let herself in and made her way to the dining room where Kelly was working. “No, the kids have been fine. In fact I haven’t seen much of them since they’ve been outside playing all morning.” Kelly picked up the seam ripper again and went back to work. “You really don’t want to know.” Disgust was evident in Kelly’s voice. Kelly glared at her again. “All morning.” The seam ripper attacked the crooked stitches, jerking them out one at a time. “I can do this. It just takes me awhile.” Her voice rang with determination. “That would be so cool—a tea party for a bunch of 8-year-olds. Were you going to have them dress up and serve tea cakes on china and everything?” Laurie smiled, seeing her sister weaken. “That was the plan, but now I just don’t have time. This silly little quilt is going to take up all my spare time.” The wistfulness in her voice was getting stronger. “The party may be over that quickly, but the memories will last longer than that quilt you’re killing yourself over. Even without all the pictures you take of the parties and then put in a scrapbook!” Laurie spoke gently, understanding her sister’s heart. Don't forget to join us at Cat's place for more Fiction Friday links! I've been reading about Abram—what a man of faith he was! God said leave home and go—and Abram did, even without knowing exactly where. But what really stood out to me as I read these chapters this time is that his walk of faith was not without bumps. There were times when he was not walking in faith, but God was faithful even through those times. The famine in the land of Canaan sent him running to Egypt rather than running to God. Egypt plagued him and caused problems for him for the rest of his life. It was there he acquired more animals—which later caused problems between him and Lot. Not only did Abram acquire animals in Egypt, but what nationality was Hagar, the mother of Ishmael? Egyptian. So why did Abram go to Egypt when God had sent him to Canaan? Because of not trusting God. The Bible doesn't record Abram asking God what he was to do (go or stay), nor does it record Abram asking God to supply their needs. It appears that Abram used only his head and not his knees. Ouch. How often do I do that? This is a pattern that repeats itself in Abram's life. He looks to human ways to solve life's circumstances and problems. This something that we can relate to. We see something that needs to happen, or to be done, and we get busy making it happen. We use the heads God gave us and we figure out how to take care of the problem, without stopping to remember that we need to use our knees before we use our head. When we're busy doing and fixing, we often forget this important fact. Nothing is too difficult for the Lord. When we remember that, we're more likely to hit our knees before hitting the road. When we remember that, we're more likely to hit our knees and not end up holding our heads in pain and shame. The New Year is a time for us to let go of the past and look forward to newness. Everyone thinks about that differently. Answer any of these questions, all the below, or just give your thoughts about the New Year. 1. What is your favorite "resolution" in the Bible? 2. Do you do a New Year's resolution? Why or why not? Does your family make a resolution together? 3. Usually a resolution comes as a result of regretting something you didn't do the year before...how do you let go of the regret and move forward? 4. (optional...only if you wish to share) Have you ever made a resolution in the past that you didn't keep and wish you had? Okay, to be perfectly honest with you, I cannot remember the last time I made a New Year's Resolution. It took me about two year's failed resolutions to realize they didn't work for me. Thankfully, I found what does. Goals. So I dream big and reach for the stars. Yes, it means I don't quite reach my goals (as Joanne can attest to. LoL) but it keeps me moving forward and that forward motion is so important. For this year I have writing goals, Bible reading goals (Cover to Cover, chronologically in 2009), and now, new this morning, I have Scripture memory goals, which I want to share with you. My friend Kristen posted about this and it was exactly what I've needed and wanted, and I'm soooo excited! Beth Moore, at the LPM blog, has encouraged and challenged us to join her in memorizing 24 verses (of our choice) this year. There's a huge accountability team there (when I just checked and there's 2936!) and I joined in. (For those of you wanting to memorize John 15, go visit Vonnie, that's what she's doing this year!) Scripture memory is something I used to do as I walked in the mornings, but when that ended, so did my memorization time and I've missed it greatly. I'm starting with Philippians 3:13-14. I've got my 3x5 card on my keyboard and I'm working on it. Don't forget to join us at LauraLee's for links to more At The Well thoughts. One of my favorite events of the year is finishing up a read through of the Bible and turning back to Genesis and starting all over again. There are times when I haven't made it in a year, but that's okay, I made it. This last time it took me two years to read from cover to cover, and I was blessed tremendously and grew so much. This time my plan is to complete my cover-to-cover expedition in a year. I know that there are others that are doing the same thing, and I think it'd be great if we were to encourage each other in our journeys. My plan is to read through chronologically, because that's how I like it best. It puts the Biblical events in time-line order and puts them in perspective for me. I've done it this way four times now, that I have recorded, and I love it. I'm not one to get hung up on the schedule. There are days when I read a chapter and others that I read ten—to me the point is that I'm reading and meeting with God. The schedule provides structure for me, but I don't let it bind me up in knots. I'm not one that works well with knots. Realizing that was very freeing for me, and as a result, when I hit the back cover of the Bible—well, when I finish Revelation 22:21 I know that the next passage I'll read is Genesis 1—regardless of what time of year it is. This last time through, I finished at Christmas and I started in Genesis 1 on December 26th because I didn't want to wait. If I continue at the rate I'm reading right now, I'll be done early. But there are times when I slow down, for many different reasons. So, my goal is to finish by December 31, 2009. What about you? 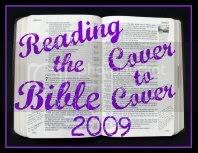 Do you read cover-to-cover or do you jump around or do Bible studies using a book? I'd love to hear how you approach Bible reading. I've been turning over ideas of how to encourage each other in this journey and the only one I've settled on so far is a button to put in my side bar. Feel free to copy it (by saving it to your computer) and post it in yours, too. It will not link back to me, although the one in my side bar will link to this post to remind me of my goal to complete my read-through in this calendar year. It is simply a picture to encourage and remind us of our goal. Better yet, make your own button and link it to your post telling us how you read through. I'd love for you to leave me a comment here with a link to your post so I can be encouraged by it. Also, be sure to check out Linda's Heart of a Ready Writer blog. She's reading through this year too, and blogging about it. This week Joanne at An Open Book is hosting Fiction Friday. Be sure to join us there for links to more fun fiction. Melissa had just sprinkled Comet in the tub when the phone rang. “Well, nuts. I had hoped to get this done.” While on the phone she unloaded the dishwasher, and cleaned the kitchen, proud of herself for using her time wisely by multi-tasking. Setting the phone in its cradle to charge she thought of the things she could do with the extra time she now had. Suddenly she was struck by the silence. She peeked around the corner into the living room, hoping to see the kids engrossed in their blocks, but there were no kids there. She followed the muted jabbering into the master bedroom and came to a quick stop. The boys looked at her. “Hurt, Mommy?” Josiah, her two-year-old asked. “Just a little.” Melissa answered his sweet question. “What are you boys up to?” Now that she’d had a chance to really look around she didn’t’ know whether she should laugh or cry. A small chuckle slipped from Melissa. “Monkey see, monkey do,” she thought. “A love note on the mirror like I write for Daddy?” She was relieved to see she had intervened before the lipstick had made its way off the mirror and onto the wall-paper. Melissa looked back at Josiah. “And what about you, young man?” He had her favorite lipstick stretched from one ear to the other, on his upper lip and clear down to the tip of his chin. A little bit had actually landed on his lips, but not much. “Pweddy.” Josiah was not a man of many words, but he got his point across. Melissa bit her lip, gently, and worked very hard to keep from laughing out loud. Melissa hunkered down while she thought fast, she didn’t want to stomp on their thoughtfulness, but she needed to prevent a reoccurrence. “Now listen, boys, do you see Daddy wearing lipstick?” Josiah looked to his big brother, who scratched his head while he thought hard. “No, Daddy don’t wear lipstick. Onwy mommies does.” Jason shared his great realization with Josiah. The boys lit up. “Nana!” They scooted around their mom and raced to the front door. From the other side of the house, the side Melissa had started cleaning the bathroom on, she heard Sarah’s delighted cry. “My-oh-my! What have you boys gotten into this time?” Nana spoke from behind her hand, and her eyes twinkled merrily as she looked at her grandsons. “Pweddy,” Josiah said, proud of his accomplishment. Melissa felt her heart sink. The last time Sarah had ‘helped’ on her own the goldfish had been blowing bubbles before they died in a bubble bath she had prepared for them. She just knew they would enjoy one as much as she did, so she shared. “The baffroom. That’s where you left it on accident. “I’m a good helper, Nana.” Sarah proudly said to her grandmother. “Pweddy.” Josiah said as he touched his fingertips to his lips. Don't forget to join us at Joanne's!